Marvel is bringing back the Spirits of Vengeance as part of its legacy event, this title was popular in the 90s and Marvel is getting in touch with its spooky side in this reboot from Victor Gischler, David Baldeon and Dan Mora. This time round the Spirits of Vengeance will not be a variety of Ghost Riders out to punish the wicked, instead Johnny Blaze will be joined by some other Marvel supernatural warriors in an all new line up. In Part One, “War At The Gates Of Hell”, a war between Heaven and Hell has raged in the unseen corners of society, both sides in delicate balance that could topple if the right weapons were in the wrong hands. 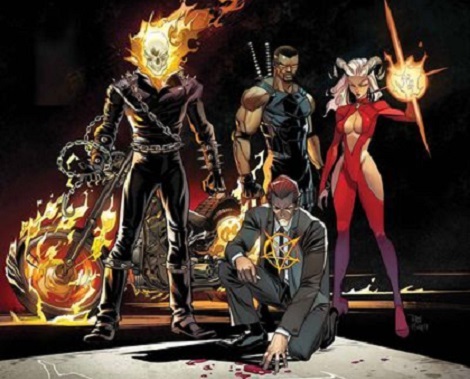 When an undercover angel is murdered, Johnny Blaze, the Ghost Rider and a deadly team must rise from the darkest depths of the Marvel Universe to form an unholy alliance – Hellstorm, Satana and Blade – they are the Spirits Of Vengeance and will find the killers and punish them. War At The Gates Of Hell Part 2 is out on November 8th, someone has unearthed a weapon that can the tip scales in the war between Heaven and Hell and an ancient summit known as the Covenant is set to be the venue to use it.